I now have 6 years of post-initial qualification teaching experience, but my love affair with the world of education began a lot longer ago than that: My first foray into “teaching” EFL was helping out in my mum’s primary school L2 classroom when I was a teenager. Since then, I’ve done a language assistance-ship in France (as part of my degree in English and French literature) which involved teaching primary school children EFL, volunteered at a summer language camp in Romania, completed my CELTA at the University of Sheffield ELTC, taught all ages and abilities in an EF English First school in Indonesia, experienced the frenzied pace of a summer school by teaching on Newbury Hall International School’s OISE programme, taught in Jakarta, also developing a school magazine and upgrading an existing study centre facility and worked at a mixture of language schools in Sheffield and Leeds, in the UK, teaching learners with a wide range of backgrounds, including asylum seekers, economic migrants and holiday makers. I recently finished working at International House in Palermo, Sicily, where I taught a mixture of young learners, teenagers and adults general English and exam prep classes between October and end of May for two years running. In the summer of 2014, between my two Palermo stints, I worked for Sheffield University, on their 10-week pre-sessional programme, preparing students for study at the university and coaching them to meet their entry requirements in the university equivalent of the IELTS exam. Following a second summer pre-sessional at the University of Sheffield, I have been working part-time on the ELTC’s evening course programme. This has given me the opportunity (time!) 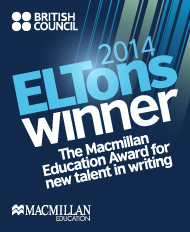 to edit my ELTon award-winning materials to make them suitable for publication (on www.onestopenglish.com) and deliver numerous workshops (at the ELTC, at Leeds Beckett University on the M.A. in ELT and online!). I have just signed a contract that means from April until September I will be working full-time at the University of Sheffield. Thereafter? Watch this space! Between mid-September 2012 and mid-September 2013, I did my DELTA, all three modules, at Leeds Metropolitan University, gaining a triple distinction, and an M.A. in English Language Teaching, within which the the Delta was integrated, and for which I also got a distinction. I have since completed the IH Young Learner and the IH Tutor Training certificate training courses, in Palermo, and have also done some Cambridge speaking examiner training for KET, PET and FCE exams, as well as the Cambridge YL Suite of Starters, Movers and Flyers. At IHPA, I was also lucky enough to attend workshops regularly, and to have the opportunity to deliver them to my colleagues too. In addition Sheffield University, last summer and this summer, I attended a week-long induction prior to starting work on the 10-week pre-sessional programme there, in which the majority of the sessions were dedicated to training us in teaching English for Academic purposes and in using relevant tools such as their VLE (virtual learning environment) which is a branded version of Blackboard, Google Drive and Turnitin. Since then, working at the ELTC has given me access to attending a variety of workshops as well as delivering a few of my own, participating in a training day (as both a speaker and attendee!) and in a couple of scholarship circles. My current areas of interest developmentally are teacher training (I am currently trying to build on what I learnt from the IH Tutor Training cert) and EAP. In terms of writing, I recently had the pleasure of seeing my first peer-reviewed journal article appear in a special edition of the Innovation in Language Learning and Teaching. Additionally, of course, thanks to International House, for a while I had my very own column in the IH Journal, the first of which appeared in the Autumn 2013 edition. I have also written an article for the first IATEFL Materials Writing SIG newsletter as well as book reviews for the ETAS (English Teachers Association in Switzerland) journal and for English Teaching Professional magazine. Finally, I am waiting on publication of a book chapter that I wrote for the IATEFL Learning Technologies SIG edited book due out this year. In addition to teaching and writing, I am interested in creating learning materials, doing research projects and presenting at conferences. I presented for the first time at the Warwick International PG Conference in Applied Linguistics, in June 2013, closely followed by my second time at MATSDA’s annual 2 day conference in Liverpool, in July 2013. 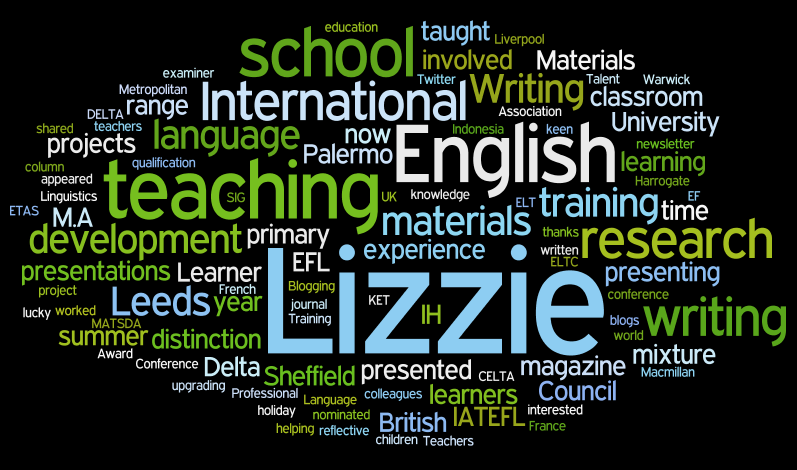 Last year I presented at IATEFL Harrogate (an exciting learning experience and a first for me! So exciting in fact that I followed it up with another presentation at IATEFL Manchester this year) and have also done a webinar on Learner Autonomy as part of the British Council Teaching English website series (another first!) as well as one on Metacognition for the IH World organisation. Another exciting development last year was when I won a British Council ELTon (The Macmillan New Talent in Writing Award) for a set of materials that I made for my dissertation project at Leeds Met. I am currently working with an editor from Macmillan to prepare these materials for publication on their Onestopenglish website. I have also written some A1 level reading worksheets for Richmond ELT, another very interesting experience. I’m blogging because I’ve loved reading other teachers’ blogs about their ideas and experiences and want to send my own little boat off into that big sea of shared knowledge. My blog contains information about my materials development, research project and presentations as well as reflective writing, a range of classroom activities and a wealth of links related to the Cambridge Delta and the Leeds Met M.A. ELT. Thank you 🙂 Good luck to you too – enjoy the course! Lizzie. This is Heidi Bay from www-really-learn-english.com. 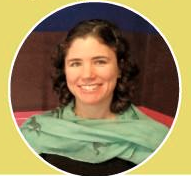 On behalf of the Really Learn English website on English teaching and learning, it is an honor to inform you that your blog Reflections of an English Language Teacher was selected as a nominee for the Best English Blog Awards of 2013 Competition. We have reviewed more than 100 blogs from all over the world. The quality of the shortlisted blogs was extremely impressive, and after evaluating each of the qualifying blogs on the criteria of effectiveness, writing style, English teaching relevance and quality of information provided, the team of Really Learn English came to the consensus that your blog should advance into the next round as a nominee. CONGRATULATIONS! Your accomplishments as a blogger are appreciated and are important to the continued growth of the English Teaching community. 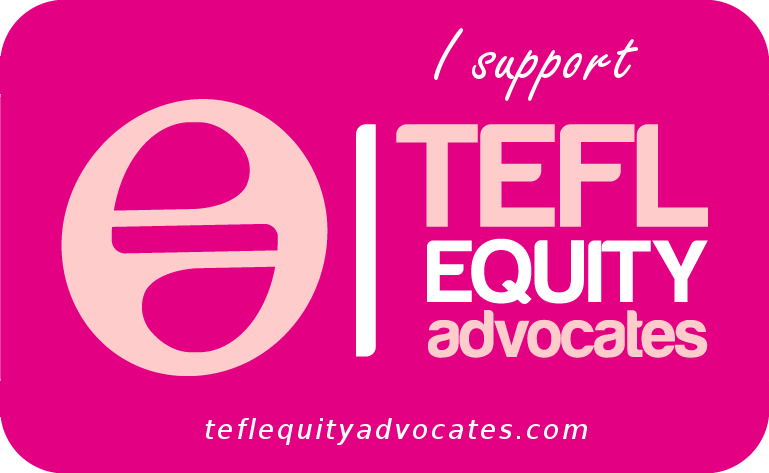 We are excited about your continued research and work on English teaching, wonderful articles and presentations for all the English teachers and learners out there and all the hard work you have put into every article you have created. All the different topics make your blog a teaching and learning haven. It helps set new benchmarks for excellence and passion for teachers and students alike. For additional information about the competition, you can visit this link http://www.really-learn-english.com/best-english-blog-awards.html. It contains the contest’s scope and how you will be entered as nominee with a feature on our website. As a nominee, you will be featured in an interview (which we can do by e-mail). This short interview will assist the public on the voting process. Participation in the competition will also require you to display a Best English Blog Awards of 2013 Nominee badge on your blog with a link to the voting section on Really Learn English. So anyone visiting your blog can help you gain more votes! Public voting will determine the winner and will be made via the Really Learn English website. This will occur sometime between September and October, after which the winner will be announced. The winner will then be featured on Really Learn English and receive a Best Blog Awards of 2013 badge, recognizing his or her outstanding achievements. Congratulations once again on being selected as a Really Learn English Best Blog Awards of 2013 nominee! Please get back to me at info@really-learn-english.com to confirm that you would like your blog to participate in the competition. I will then send you your interview questions for the e-mail interview. Please let me know if you have any questions or would like further information on entry details. We’re here to help with any question you may have. Hi, Lizzie! I want to follow your career path. I’m interested to become an IELTS speaking examiner. You’ve got a great blog as evidenced by your nomination for the Really Learn English Best Blog. Keep up the good work! We are all very proud of Lizzie! It’s great, exactly how I imagined mine would be! And it’s motivated me to try and write a post or two over the weekend – thank you! What a lovely comment! Thank you 🙂 Look forward to seeing your posts! Your own little boat into that big sea of shared knowledge is what John Haycraft, founder of International House, would have liked to have seen, had he been with us. He liked using a similar expression: “flow of ideas”. Its a greate achievement that you have done via this short erra. I’m not native speaker but your blog enjoyed me …. I’d like to thank you for this great blog, which I found very useful while working on my module 3 on teaching multilingual classes (MUL). To show my appreciation and support, I wondered if you were interested in posting my full extended assignement plus appendices (pass), just to help other candidates in their “quest”. I’m opening a english language course here near salvador (Brazil) the city is called Lauro de Freitas ‘Villas do Atlantico” if you like tropical and surfing this is the place!!!! Well I’m looking for specialist teachers to join our group…so if you would like some more information and apply to the job don’t hesitate just write to the following address …. ( i’m brazilian but in the group we have Uk teachers and italian) age it’s not a problem …but we need experienced teachers that loves adventures and new countries and principally loves to teach !!!!!!!!!!!! I’ve been reading your blog and I think the content you post is brilliant. I’m a language enthusiast myself and along with some friends we’ve started a language app – VocApp. It is a flashcard mobile and website app that provides a number of innovative features, such as creating flashcards from a photo, creating flashcards with your voice, creating flashcards from a text (in just a few seconds you can make a set of words from your favourite song, e.g. http://vocapp.com/wish-you-were-here-pink-floyd-testo-tradotto-flashcards-186864). I imagine that you must be very busy but if you were interested in testing our app (and possibly writing a short review of it if you want) I could grant you access to our language courses and paid options of our app, so that you can explore it thoroughly. Keep up the great work! I’ll be looking forward to hearing from you. I would happy to review it for you! Will drop you a line. Sorry for the delay in response, this slipped through the net… Lizzie. Thank you Iain, very happy to know my site has helped you. 🙂 Good luck with your DELTA! Hi Lizzie , I am preparing to do my Delta in the next few months, and your blog is very helpful in guiding through the details connected to the course.Thank you so much for your great help. Hi, are you still answering questions about the DELTA ? If so, I have one. Also, I think parts of it have changed as some of Dale Coulter’s ideas are not relevant now. Hi, Lizzie. I just post to say your blog is great! I’m now teaching English in a middle school in China, and to prepare for the DELTA course. 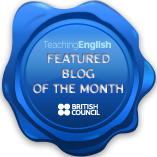 Thanks for the posts on your blog and your notes about English Language teaching. Regards! I have 2 distinctions for DELTA so far, I’m now doing module 2… I noticed you got a pass for LSA1 but a distinction overrall, could you tell me how it works in module 2 regarding the grades? I’ve heard mixed things, for example some people are saying you don’t need to pass all the LSA’s.. I’m a bit confused. Obviously I will work as hard as possible regardless, but it would b e a bit comforting to know where I stand.. Thanks for your message. I am reluctant to advise you as I am not a Delta tutor and it’s been a while since I did mine so how things work may have changed. I suggest asking your tutor about this. Congrats on the distinctions!